Sunderland have hit a rich vein of form at the right time. What is the best system to continue it? Seven games remain in our season, and it's been 18 since we last suffered defeat, back in December when down to 10 men against Portsmouth. We have won three on the trot, or six of our last eight games, putting ourselves in control of our own destiny for automatic promotion. However, the last two victories have been a result of a successful switch in formation. 4-4-2 with Will Grigg and Charlie Wyke leading the line has delivered, particularly for the latter who is playing his best football since arriving last summer. I think the last big question Jack Ross needs to figure the answer to as we move towards judgement day in League One is whether to stick or twist. we've got a poll at the end of the article for you to take part in if you fancy it. There are many benefits to 4-4-2, not least that is seems to suit Wyke and give our wingers more purpose and space, but there are also drawbacks. Can we control midfields with the same dominance we've shown in recent months? We did against Accrington at there place, but the system completely flopped against the same side at home. We were not at our fluid best then or against Rochdale, so switching to a 4-5-1 or 4-3-3 formation is probably the safer option . However, can we afford to play it safe? No. We have to grab games by the scruff of the neck, and in such a congested period of fixtures, having consistency both in our system and performances is what will get us back into the Championship. 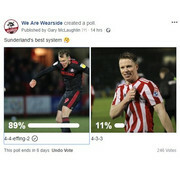 Here at WeAreWearside we love to present Sunderland fans' views because, quite frankly, we know nowt and it saves you having to read 500-600 words of my waffle. So we put the question to the people - framing the alternative as 4-3-3 (simply because I think our wingers tend to be more advanced than the left or right midfield 4-5-1 presents). The Twitter poll results showed 87% of 346 voters siding with 4-4-2. Conclusive. What about Facebook? 89% in favour (sorry desktop users the image will probably look tiny to you). Again, 4-4-2 getting massive support from our social media followers. Eventhough there is some acceptance that 4-4-2 is not the be all and end all, it would seem the masses agree it's our best chance of sealing promotion. Paul's point of tactical flexibility is something to consider, perhaps not at the start of games but absolutely beyond half time. There is bound to be another first half like the home game at Accrington and we have to be prepared to change things quickly as and when required. Looks like it's 4-4-2 again for this evening, and three more points hopefully! Just for the craic, we've asked the same question in the poll below too. Sunderland's best formation right now?